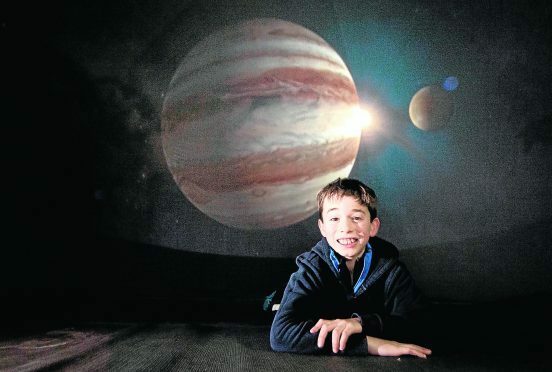 Thomas Bogie learned about the night sky at the Tomintoul and Glenlivet Landscape Partnership planetarium event. Campaigners are preparing to have Tomintoul and Glenlivet designated as part of the first “dark sky park” in the north of Scotland – recognising how bright stars shine in the night sky. A bid is expected to be submitted to the Arizona-based Dark Skies Association later this year to recognise the lack of light pollution in the area. Scotland’s only other dark sky park, which is in the Galloway Forest in the south-west corner of the country, is estimated to contribute about £500,000 a year to the winter economy there. David Newland, the lead volunteer who is preparing Tomintoul and Glenlivet’s case, already runs events to educate people about the dazzling lights in the sky that are invisible during the day. He said: “We hope that when we get the accreditation that businesses will be able to market themselves on the back of it. “Whether that’s accommodation providers being able to specialise a little bit more, run stargazing evenings to show visitors what’s up there or simply providing binoculars. Laurie Piper, operations manager of Moray Speyside Tourism, has backed the proposal as a “great idea” while describing dark sky events as a “growing sector”. At the weekend a planetarium event was organised in Tomintoul to give visitors a taste of what can be seen above their heads at night. Enthusiasts were taken on a trip to the International Space Station and to the edge of the solar system as well as being educated about “dark matter”, which is believed to form the building blocks of the universe. Stars have become clearer over the Moray countryside during the last two years after the council committed to replace old-style halogen street lights with energy-efficient LED bulbs. The £5.5million project was devised to cut energy bills in half but has also reduced the amount of light pollution clouding views into space. The Tomintoul and Glenlivet Landscape Partnership is supporting the dark sky park bid as part of their £2million Heritage Lottery Fund grant. The proposals span a total of more than 20 projects aimed at preserving and enhancing historical and natural attractions in the area. Interpretation officer Elspeth Grant said: “Dark skies is just one part of what we are working on. What is a dark sky park? The international Dark Skies Association classes a “dark sky park” as a large area of land with exceptional night time views. It is estimated that in a city centre the naked eye can see about 100 stars at a time. However, in a dark sky park that multiplies to more than 1,000 including seeing part of our Milky Way galaxy stretching through the dark. The Galloway Forest in Dumfries and Galloway was recognised as the first dark sky park outside of the USA in 2009. Now other sites have been named in the UK at Northumberland, in Wales at Snowdonia and the Brecon Beacons, and at Exmoor. Meanwhile, Coll in the Western Isles, which has no street lights, is a “dark sky island” and runs astronomical events through the year. Several locations on Skye as well as near Thurso, Lochinver and Drumnadrochit have been classed as “discovery sites”, which have low light pollution to allow a glimpse of distant constellations.